Representatives from the video game industry are expected to meet Thursday with President Trump to discuss their product’s impact on youth violence, according to White House Press Secretary Sarah Huckabee Sanders. But likely participants say that regulating media content isn’t a solution to tragedies like the Parkland shooting, and experts have roundly dismissed the administration’s focus on gaming as fanciful. The announcement comes as we approach the one-month anniversary of February’s massacre at Marjory Stoneman Douglas High School. The fallout from the shooting, which has precipitated a surge of youth political activism and a renewed debate around gun rights, continues to dominate national headlines. Trump first posited a link between violent games and mass shootings at a White House conference on school safety in the week following the killings. Nikolas Cruz, the psychologically troubled former student who confessed to the killings in Parkland, was known to play such games as much as 15 hours a day, the Miami Herald has reported. The purported brutality of both games and movies “is really shaping young people’s thoughts,” the president remarked at the conference, adding that both should be subject to ratings systems. (They already are.) But the president has previously tweeted that the games are a dangerous influence that must be checked. The alleged harmful effects of gaming have been trumpeted by advocacy groups and politicians from both parties since the earliest days of the medium, when concerned parents believed that arcades would seduce children into a life of truancy and drug use. After the Columbine killings in 1999, victims’ families sued the makers of several games, claiming that teenage killers Eric Harris and Dylan Klebold had been warped by hours of playing gory fan favorites like Doom and Mortal Kombat. The lawsuit was later dismissed. And yet, as media commentators have wasted no time pointing out, there’s practically no evidence indicating that video games trigger violent behavior. Young people — especially boys — have shot, stabbed, and throttled innumerable digital enemies in the decades since video games became available for use on home consoles; by some estimates, 90 percent of American kids are at least intermittent users. But numerous studies have failed to detect any elevated tendency of gamers toward violence. Christopher Ferguson, a psychologist at Florida’s Stetson University, has conducted long-term investigations of the correlation between depictions of violence in media such as movies and video games and its occurence in the world. He has emerged as perhaps the most frequently cited skeptic of the president’s theory. The Entertainment Software Association — a trade group representing prominent video game publishers like Capcom, Microsoft, and Nintendo — has produced a fact sheet downplaying the connection between digital and real-life violence. 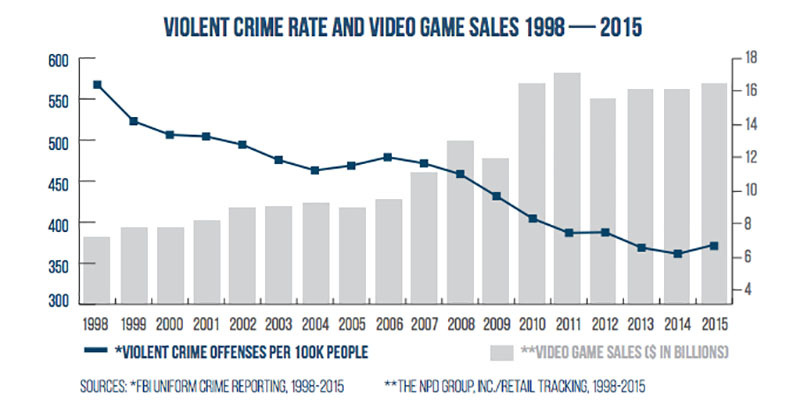 It argues that the national violent crime rate has plummeted since the early 1990s, even as 40 percent of American adults report owning a dedicated gaming device such as a Playstation or Nintendo Switch. If anything, the national trend over the past two decades has been toward less violence among children, not more. Researchers using data from the National Survey on Drug Use and Public Health have found that youth fighting and violence decreased by 29 percent among all ethnic groups between 2002 and 2014. The Department of Education announced in 2015 that the prevalence of bullying among students between 12 and 18 dropped from 28 percent to 22 percent over the same time period. Other studies, including one released by the American Psychological Association in 2015, have pointed to a causal relationship between child video game use and some forms of physical and verbal aggression. But they also differentiate between aggression and criminal violence. Citing free speech concerns, the Supreme Court voted 7–2 in 2011 to strike down a California law banning the sale of violent games to minors. “Disgust is not a valid basis for restricting expression,” wrote Justice Antonin Scalia in the majority opinion. In a statement released Monday, the Entertainment Software Association said it intended to make its case to the president.